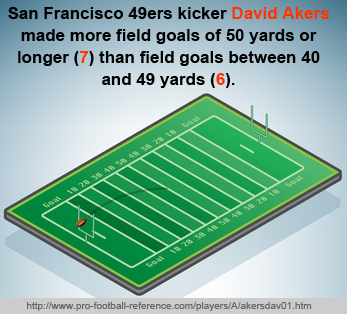 Most of the top NFL kickers in 2011 had the highest extra point totals, but leading scorer David Akers earned the top spot thanks to 44 field goals, eleven more than any other kicker. 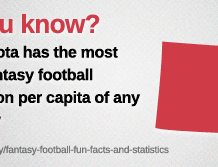 Here is further information for your weekly or season-long fantasy football league. After 13 years in Philadelphia, Akers went west and had his best season ever with 166 points, 19 more than any other kicker. It was the second straight season Akers led all kickers after scoring 143 in 2010 in Philadelphia. Akers has at least 139 points the last four seasons. After missing half of 2010 with a torn quad, Gostkowski returned with 143 points in 2011, third best overall. He kicked 59 extra points. Apart from 2010, Gostkowski has at least 125 points four straight seasons. Crosby finished fourth in 2011 with 140 points thanks to a league-leading 68 extra points. In his five seasons, he has had at least 125 points four times. Janikowski has been in the league eleven years, but his two highest-scoring seasons are the most recent: 129 points in 2011 and 142 in 2010. He injured his groin in the third preseason game but is expected to be ready for the start of the season. Bailey had a successful rookie season in 2011, tying for fifth in the league in scoring with 135 points. His 32 field goals tied for third best. The Eagles drafted Henery in the fourth round in 2011 and let David Akers leave. Henery scored 118 points as a rookie in 2011 and made 24 of 27 field goals. He has the potential for more in Philadelphia’s potent offense. Hartley missed 2011 with an injured hip and replacement John Kasay showed how great it was to kick in the Saints’ prolific offense by finishing second in the league with 147 points , including 63 extra points. Now Hartley is healthy and has regained the Saints’ kicking job. He only has one full season as the Saints’ kicker, but he did kick during the stretch run and postseason of the Saints title year of 2009 and kicked the game winning field goal in overtime in the NFC title game and went 3-for-3 in field goals (all over 40 yards) in the Super Bowl. Gould’s 121 points in 2011 was his sixth straight season of at least 105 points and his third season of at least 120. Gould’s 6 field goals from 50 or more yards out (out of 6 attempts) matched the number of field goals he had from 40-49 as well as the number he had between 30-39. Prater’s 87 points in 2011 were a far cry from the 122 he had in 2009 and the 114 in 2008. But a productive Peyton Manning will brighten the Denver offensive picture. Bryant has put up similar numbers the last two years – 126 points on 27 field goals and 45 extra points in 2011 and– 128 points on 28 field goals and 44 extra points in 2012. His 93.103% field goal percentage was tops in the league. In his 20th season as Lions’ kicker, Hanson scored 126 points in 2011, his biggest total since 1995. Thanks to the Lions’ newly potent offense, Hanson had the opportunity to kick 54 extra points, fourth best in the league. 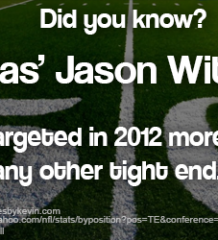 Bironas had 121 points in 2011, his fifth straight season of at least 110 points. His 90.625% field goal percentage was fourth-best in the league. Ben Hargrove writes for a variety of sports sites, including DraftStreet.com.